For the last several years, political commentator Keith Olbermann has served as an in-stadium play-by-play man for the Yankees’ Old-Timers’ Day. But the Yankees are making a change, The Post has learned. The Yankees were not happy with Olbermann posting a photo on Twitter earlier this season of a coach signaling pitches to their batters in the on-deck circle. So they decided to bounce the liberal loudmouth and will have Bob Wolff and Suzyn Waldman provide the commentary for today’s game instead. Look, it’s their Popsicle Stand and they can do what they want. More over, the Yankees – to use the Post’s phrase – once “bounced” Babe Ruth, to say nothing of Bernie Williams, and Yogi Berra twice and Billy Martin five times. I’m making no comparison, of course. But in that context, I’ve got no complaint there. I wasn’t going to say anything about this, in fact. And then somebody from the Yankees leaked it to the paper. On a personal level, however, I do know that I have a legitimate complaint in one respect. Old Timers’ Day is today, and I’ve been doing the “color” on the public address system for the last ten years, and one year prior to that as well (not the play-by-play; that is, obviously, entirely the province of Hall of Famer Bob Wolff and it’s my honor to sit next to him; Suzyn Waldman has usually been with us to do Old Timers’ interviews during the game). After eleven years of doing this, I think it would’ve been fitting if the Yankees had told me rather than let me hear it from somebody outside their organization the week before the event. It just seems like you’d want to preserve the dissemination of details about your company’s decisions like that to your company, rather than have a guy hear a rumor and then have to call up and ask. I can’t vouch for the legitimacy of the motive described in The Post because this is the first time I’m hearing about it. But on a macro level, that does worry me in terms of the suppression of information. I might have been sitting in the stands when I tweeted the photos in question, but I saw nothing that any eagle-eyed guy in the press box couldn’t have seen (and trust me, they started looking). 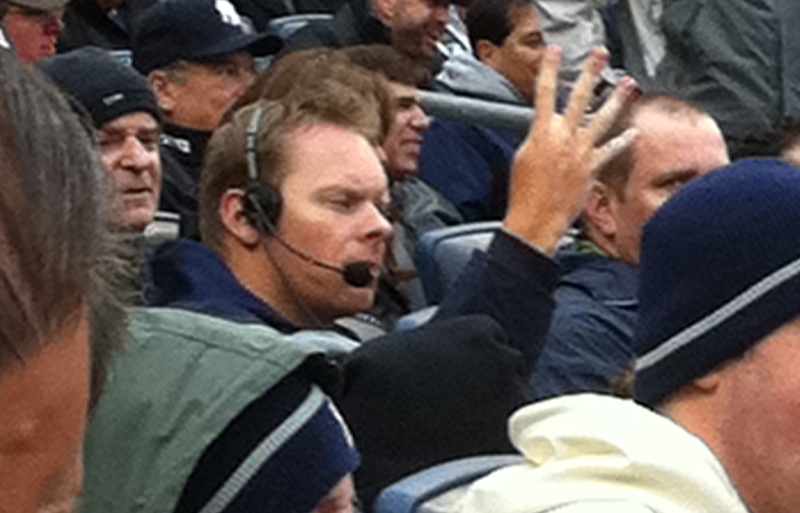 There was a coaches’ assistant in a Yankee jacket and a Shamwow-Seller’s Headset with a radar gun sitting three rows back of home plate signalling pitch speeds to Alex Rodriguez and other Yankee players in the on-deck circle on Opening Day this year, and I took a picture of it, largely because to see the signals, Rodriguez had to basically look right over my head. The Yankees explained that the radar gun they used for their scoreboard wasn’t working that day, and the coaches’ assistant, Brett Weber, was simply supplying information the players usually got from the scoreboard. It was technically a violation of a rule prohibiting the transfer of such information from the stands or press box to the field. My point in tweeting the photo was that it didn’t seem to me to be cheating (after all, it was information about the last pitch, not the next one) — it just seemed weird. And after asking that Weber be vacated from his seat for one day, MLB accepted that explanation and he was back the next game – on the proviso that he not do any more signaling. And I haven’t seen him do any more signaling. For generations – and I mean pretty much since Jacob Ruppert bought the team in 1915 (or maybe it was from the time it moved from Baltimore in 1903), the Yankees have been notorious for trying to manage information. I can remember the day in a playoff series when they went after a fly with a cannon. We were setting up the interview stand in the clubhouse as the Yankees moved to within a few outs of eliminating advancing. Suddenly, the door opened and as intense a series of obscenities as I’d ever heard resonated through the room. It was a player who was not happy about having just been removed from the decisive game before its conclusion. Obviously, we in the Fox crew were being given a great courtesy – a few extra minutes to make our “set” look good. None of us would have dreamed of reporting what the player did – the definition of a gamer who had every right to blow off steam – or to whom his invective was directed. We were reporters, and we were “there” – but we were there under controlled and agreed-to conditions. The threats started to pour out of every Yankee exec who had contact with any of us that if we reported a word of it, there’d be hell to pay and jobs and contracts threatened. And we were all dumbfounded by the overreaction. 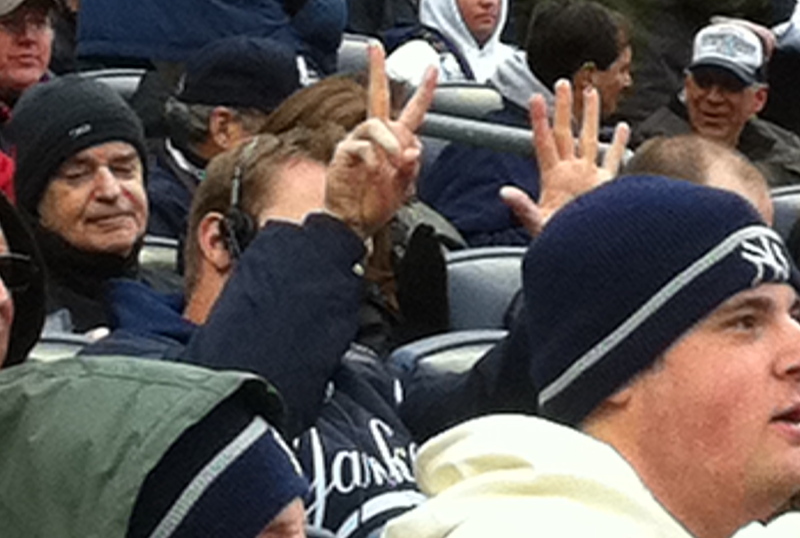 We got it – and still the Yankees yelled and threatened. There were far more dire consequences threatened about a story about Roger Clemens nearly getting into a fist-fight with a fan during the subsequent World Series. I had obtained a videotape of the confrontation, but had already decided not to run it, because it showed only Clemens’ response, not the utter and unjustifiable provocation by the fan. It would’ve made a great front page for The Post, but the video not only told just half the story, in doing so, it completely erased the truth of the story and replaced it with images that implied Clemens was entirely at fault. As I say, I had already decided not to run it, told the Yankees I had it, and that I would have to run it if the story got out some other way. And while at least one executive understood my dilemma and thanked me completely for my journalistic restraint, others made efforts to somehow seize the tape from me, or prevent my network from running it (even though we weren’t going to). It’s also kind of a shame that whoever from the Yankees leaked this information about Old Timers Day to The Post put Yankees’ Vice President/General Manager Brian Cashman on the spot. In my previous capacities at SportsCenter, and later as the host of the Playoffs and All-Star Game on NBC, and of Game Of The Week and the World Series on Fox, I have often reported things Cash didn’t like, but he’s always been professional and pleasant and there are few in the media who have had the slightest serious problem with him (a record that very few other Yankee figures of the last 40 years can claim). The day that The New York Daily News published the story of the tweetpic of Weber, four fingers raised, I happened to be at the ballpark and got corralled by the beat writers who were trying to figure out what it was all about. In the middle of this, Cashman came over to explain, and to say it was no big deal from the Yankees’ point of view (as I said it wasn’t from mine) and to very publicly reassure me that the team had no problem with what I did, or with me. Today, this statement seems to be inoperative. Back on that brilliant spring Saturday in April, Cash even had a joking explanation for this: “He was just ordering four beers, Keith,” Cashman said with a laugh. I believe this also stems from Keith Tweeting a picture of Jorge Posada’s name crossed out on Joe Girardi’s lineup card on the day Posada asked out of a game. As he was NOT a ‘reporter’ that day, in my opinion, Keith had no right to post that picture other than to fuel his own ego to simply prove he can. Also, KO was obviously trying to embarrass the longtime Yankee catcher who was probably at the all-time low of a generally nice career. Who kicks a guy like that when he’s down? As a baseball fan, I find that itself is unforgivable. FYI, I’m not only a 20+ year Olbermann fan, but a frequent and loquacious defender of his and the Posada incident has soured me so much I’m sad to say I’m starting to lose faith in his political message around which I have long based my own beliefs. While the truth may never come out, don’t discount the Posada incident as a reason for Keith’s exclusion from this prestigious Yankee event. Yeah, this is pretty dumb. The tweeted picture this poster has gone nuclear over was of a copy of the printed line-up/scorecard sheets the Yankees give out in the press box and to every spectator in the suites areas who asks for it. 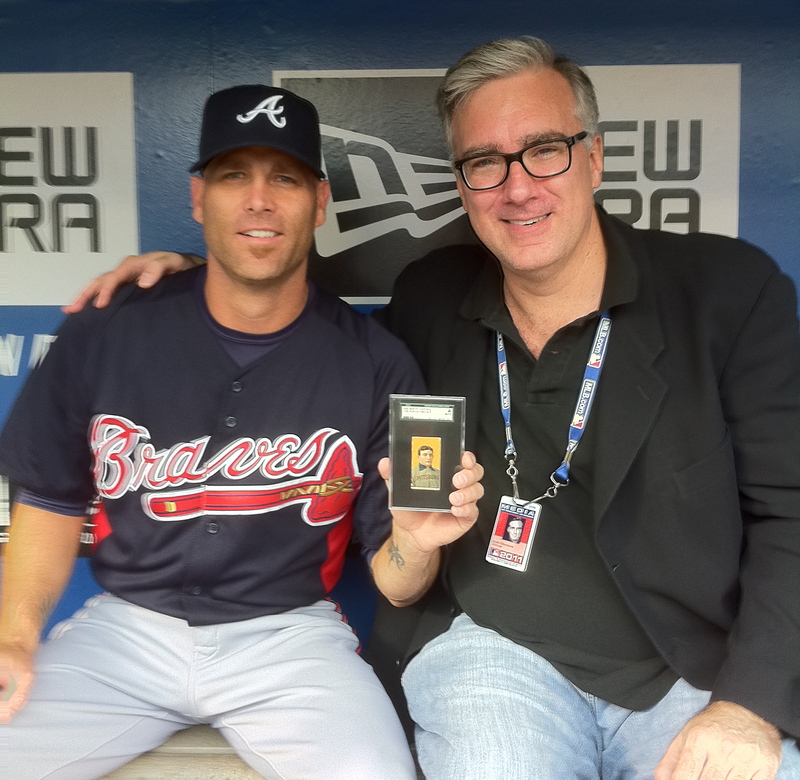 It showed where I had crossed off Posada’s name on my sheet and written in Andruw Jones’ name. It was obviously my handwriting. And I tweeted it only to illustrate tangible proof that even the Yankees had been crossed up by Posada’s unwillingness to bat ninth. Where on earth would I get a copy of Joe Girardi’s line-up card, during a game? So I was sitting there beating myself up: of course nobody gets an MRI the same night they sustain an ordinary injury, every doctor wants to wait for the swelling to go down on anything and everything. But you cannot posit this, even with the caveat that it’s a conspiracy theory and you don’t necessarily believe it. Besides which, I told myself, the math just didn’t work. The stint on the disabled list was long, but it wasn’t long enough. They couldn’t possibly be deliberately putting him on the shelf for a minor or non-existent injury just to delay his milestone to make sure it happened at home and not on the road, because the day after he was eligible to be activated they’d be playing in New York all right – but in the wrong ballpark. The Yankees were not faking or exaggerating Derek Jeter’s injury just to make sure he got his 3,000th base hit in Yankee Stadium and that they could sell to a memorabilia-addicted public everything up to and including a commemorative Mason Jar full of air from the ballpark during the moment he got it. They couldn’t be; Jeter was eligible to return from his strained right calf on Thursday, June 30, and he could resume play that day against Milwaukee, and then move into CitiField needing only six hits or less with three games to play against the Mets, and the Yankees would rather return the franchise to the league than to let Jeter achieve his milestone in Queens and not the Bronx. Of course it wasn’t a conspiracy! They’d have to come up with some additional story that Jeter might not be ready to be activated on June 30. Well, looky here: tonight an additional story that Jeter might not be ready to be activated on June 30. Frankly, if he’s late by six games in coming off the DL, he misses the last game of the Yankees’ Milwaukee game, and the entirety of the Mets’ series, and the first two games of the subsequent series in Cleveland. Bring him back on July 6 and maybe he gets a knock or two or three (but not six) there, and he walks back into the Stadium with four games against Tampa Bay and still needing six hits or fewer. Obviously, they do conduct MRIs on injuries in the hours after they occur. Even at night. But to my mind those tend to be for serious head or spinal injuries. Just a year ago, when Jimmy Rollins of the Phillies strained his calf on Opening Day (in the early afternoon no less), the Phillies waited until the next day to get his MRI done. But Jeter had his the same night as the injury and before sunrise it was evident he was going on the DL and missing the long road trip and golly if he couldn’t come back right on time he couldn’t possibly set the record at CitiField, and if he couldn’t come back within six or seven days, he couldn’t possibly set the record in Cleveland but would have a damn good chance of doing it at Yankee Stadium. For the record, these are other important Derek Jeter dates: Sunday, he turns 37 years old. And if this is a really serious strain, and he misses three weeks more than originally expected, he’d be back on Friday, July 22, when the Yankees begin a 10-game homestand. Buster Olney of ESPN.Com has just posted a very good piece about a story I first heard a week ago, one that could shatter the concepts of the American and National Leagues as we know them. As I heard it, the Bud Selig-driven committee investigating realignment was spending most of its time discussing moving one team from the National League into the American League to create two 15-team leagues. The obvious implication of those odd numbers is that from the first day of the season to the last, there would always be at least one inter-league game being played, every day – from the first celebratory week, to the final climactic days of the pennant race. Olney’s sources apparently divined this scheme after the Commissioner’s group began preliminary discussions about it with the union. I had merely heard about it during its owners-only stage. His additional details include the suggestion that the 16th NL team switching to the AL might be the Astros (to give them an all-Texas rivalry with the Rangers; in fact the Marlins and Rays could probably better use this benefit), the possibility that divisions would be eliminated altogether and each league’s 15 teams would simply vie for five playoff spots (hey, great, more crap – your opportunity to buy tickets to see a 13th-place team, or, if you’re really lucky – a battle between both 13th-place teams!). The divisional system introduced in 1969 is troublesome enough – it broke the tradition that the pennant race really determined the best team, because each team played every other team the same number of times. But it became necessary once the leagues got beyond 10 teams, for the reasons hinted at above. In the 1890’s, when the National League stomped out both the upstart Players’ League, and then its former rival the American Association, major league baseball became one league of 12 teams. Hope dies early in a 12-team league. On this date in 1899 – June 11 – ten of the twelve teams were 8-and-a-half games out or more. Last place Cleveland was already 26 games out of first place and would end the year a whopping 84 games behind the pennant winner. The divisions are a necessary evil, but inter-league play is an unnecessary one, and making it a virtually daily part of the menu would make a joke out of the pennant races. As it is now, how you do in inter-league pretty much determines whether or not you’ll win anything. And how you do in inter-league pretty much depends on who you play in inter-league. And who you play in inter-league pretty much is determined by which match-up will draw the most fans or the most tv viewers. When Selig rammed inter-league play through in 1997, it still wore a fig-leaf that at least within divisions, each team would have the same inter-league opponents. The A.L. East would play the N.L. East one year, then the N.L. Central the next, then the N.L. West the third. This was abandoned as soon as the fervor swelled around Mets-Yankees, Giants-A’s, White Sox-Cubs, Dodgers-Angels, etc. Right now inter-league opponents are selected for marketing reasons, and give some teams decided advantages over rivals in their own divisions. This new proposed system could make that disparity even greater. Unless there is some intention to reduce or scatter the current twice-yearly Festivuses of inter-league (and when has baseball ever reduced anything?) in a roughly 26-week schedule with approximately 52 “series” a year, each team in a 15-team league would probably go from playing six inter-league series a year to as many as eight or nine. By definition, some teams would get an easier schedule than others. By definition, the likelihood that the World Series teams would’ve met during the regular season increases – further flattening the bubbles in that champagne. Inter-league has been interesting and novel in some cases (Yankees-Mets was thrilling, then interesting, and is now routine) but it has adversely affected what the pennant races mean, and it has been a nightmare for National League teams used to defending against eight-man batting orders. Just as it’s time for the concept to be discontinued or reduced, MLB is – naturally – looking to increase it. Why not just give the teams with the top national tv ratings a first-round playoff bye?